Since the one-shot came out I've been anticipating this series but I still haven't fallen in love with it. So far, it's a serviceable sci-fi dystopian comic with a protagonist I'm still trying to like but have found a little off-putting. This second issue finds Ana aka War Mother being held captive in some unknown complex by captors we know very little about. The minions themselves don't speak but fight fairly well. Unfortunately, during the fight scene, there was one really odd transition that had me doing a double-take. 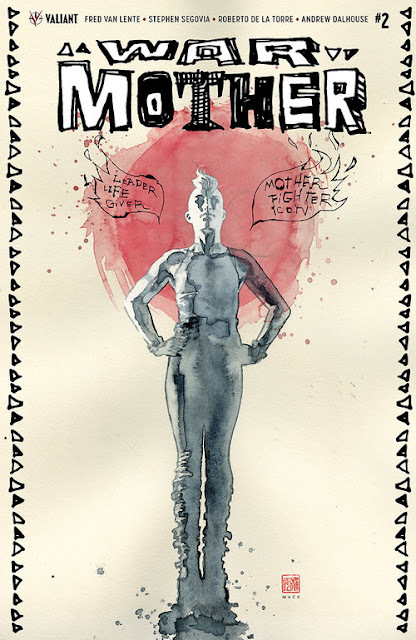 'War Mother' is not a bad comic and perhaps my expectations were too high for it. The vibe I originally got from it was Furiosa from Mad Max: Fury Road but since that one-shot Ana seems more generic albeit a little more arrogant than you want your hero to be. There should always be some conflict that the protagonist should overcome but while approaching that conflict it should be taken a little more serious than she does. Here, she has to fight off some emotion-less silent adversaries while trying to find her "War Son" rifle named Flaco. Flaco tries to guide her via their communication link and the dread she feels that her people have come to find her but that could prove deadly. There are some intriguing plot developments but I just wished we got more from the villains behind it all. The cliffhanger is solid but lacks some context. What is not unclear is the excellent art from Stephen Segovia, Roberto de la Torre, and Andrew Dalhouse. Except for that one transition that seemed to have skipped some panels (to be fair, it may have been the digital copy I was given. Hopefully, the published one is complete.) the art is well-paced and moody with muted colors that adds some eerieness to being in the enemy's lair. 'War Mother' continues to be a work in progress. I want to love it but the hero's attitude and the slow reveal makes it difficult. The story has advanced but without a clear villain and more coherent storytelling, it's hard to recommend. The art is exceptional but I need 'War Mother' to have more of a soul that I can cling to.